Make sure that every detail is about love – the interior, clothes you wear, drinks and of course, the food. This is a perfect opportunity to give something sweet to someone special. 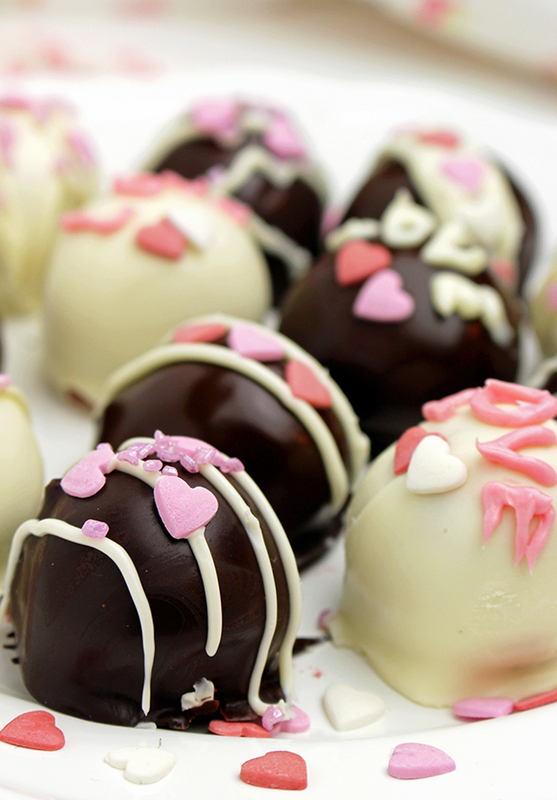 So, I suggest a special treat – Valentine‘s Raspberry Chocolate Truffles. After successful chocolate cheesecake recipe (currently 2nd and 3rd most popular recipe on blog) No Bake Layered Chocolate Mini Cheesecake and No Bake Chocolate Cheesecake Bars I’ve decided to make a fantastic no bake dessert. So easy to prepare, delicious and looks awesome. Raspberries are red; the color of love and so is the inside of these amazing balls. What do you need to make this Raspberry Chocolate Truffles? How to make Raspberry Chocolate Truffles? Line baking sheet with wax paper and set aside. Put Oreo cookies in the food processor and crumble it. In a medium sized dish mix cream cheese, powdered sugar and raspberry syrup, using spatula. Add crumbled Oreo cookies and melted coconut oil and keep stirring until well combined. Leave in the fridge for an hour. Take the mixture out of the fridge and roll mixture into 1 inch balls, with your hands. Place them in an already prepared baking sheet. Leave them in freezer for about 15-30 min until they are firm. Melt white chocolate, ⅛ teaspoon vegetable oil and stir well. Chocolate should be in a smaller, deeper dish. Take the balls out of the freezer. Put one ball in a dish with melted chocolate. Turn it around with a fork until it is all coated in chocolate. Try to be quick, so that the balls don‘t lose their shape. Take the ball out and wait for a few seconds until the chocolate stops dripping. Put it on the wax paper using toothpick. Do the same with the rest of the balls. Drizzle with melted chocolate and sprinkles. Repeat the procedure with the dark chocolate and the rest of the balls. 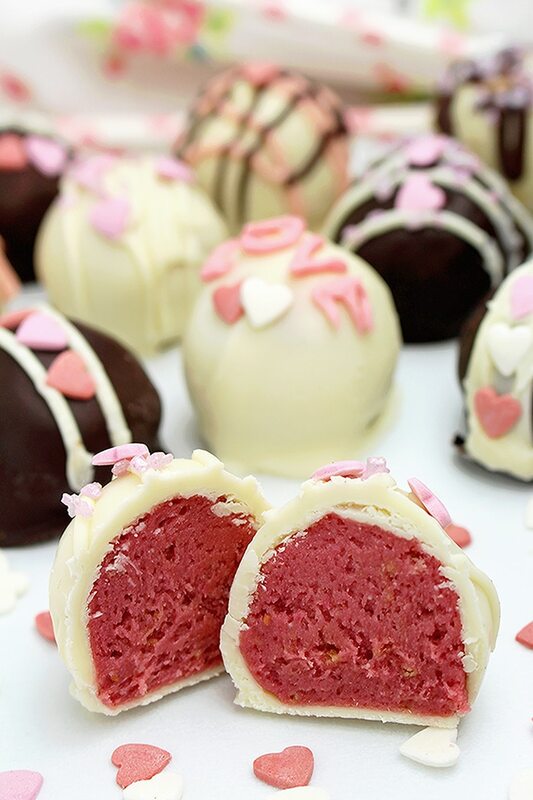 Red balls covered with chocolate and decorated especially for this occasion – Valentine‘s Raspberry Chocolate Truffles – a perfect, home – made gift for Valentine‘s Day. 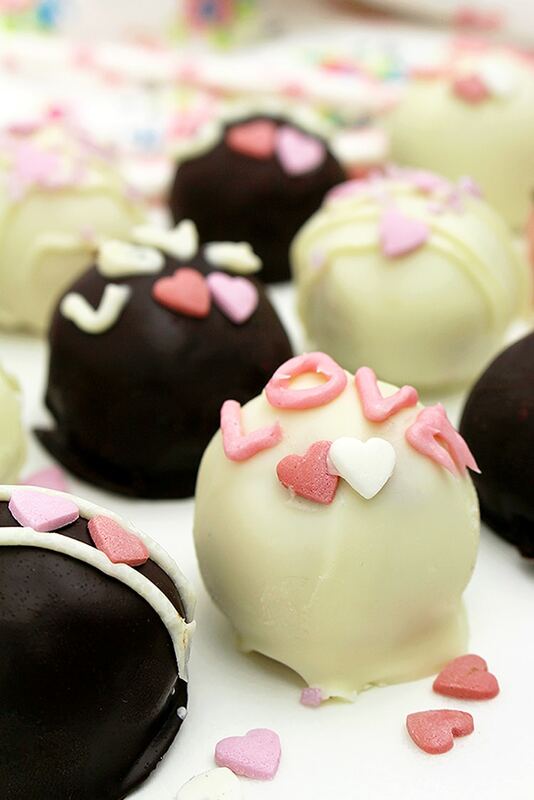 Let your partner melt with love and joy, just like these balls melt in your mouth. Raspberries with white chocolate or raspberries with dark chocolate… get your perfect combo. So, roll up your sleeves and with the sounds of your favorite music and a smile on your face make something special for your loved one. Make the Valentine‘s Day sweeter with this amazing treat. Let there be love! Store them in the fridge, in a tightly closed container no longer than 5 days.